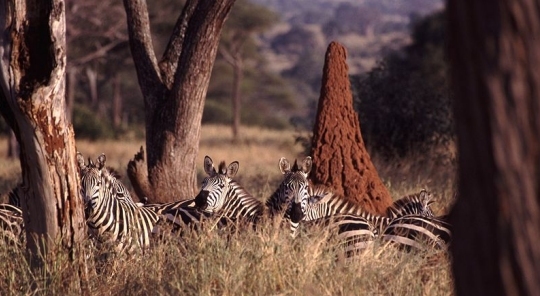 The termite mound behind those zebras makes life better for the plants and animals surrounding it. These mounds are really the supermarkets of the savanna. How do termite mounds become “supermarkets of the savanna”? It’s because of the engineering prowess of the termites. If the soil is too sandy to make their mounds, the termites add clay to it. If the soil has so much clay that it is difficult to excavate, the termites add sand to it. Either way, they end up making the soil more ideal for plant growth. In addition, the engineered soil helps the mounds hold onto water more efficiently. Indeed, when an African savanna goes through a dry spell, most of the plants turn brown. However, the plants that grow in and around the mounds remain green. Using detailed observations and manipulative experiments in an African savanna, we show that these mounds are also local hotspots of animal abundance (secondary and tertiary productivity): insect abundance and biomass decreased with distance from the nearest termite mound, as did the abundance, biomass, and reproductive output of insect-eating predators. In the end, then, termites produce a benefit to many of the organisms living near them, which causes them to promote a healthy ecosystem. The majestic animals most closely associated with the African savanna — fierce lions, massive elephants, towering giraffes — may be relatively minor players when it comes to shaping the ecosystem. The real king of the savanna appears to be the tiny termite, say ecologists who’ve found that these humble creatures contribute mightily to grassland productivity in central Kenya through a network of uniformly distributed colonies. Termite mounds greatly enhance plant and animal activity at the local level, while their even distribution over a larger area maximizes ecosystem-wide productivity. The earth’s ecosystems are incredibly well-designed. The more we study them, the more we come to understand the depth and complexity of that design, which indicate the power and majesty of the Designer.